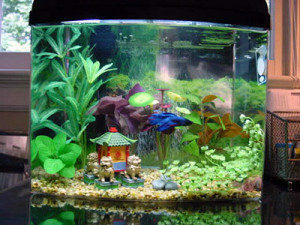 Fish tanks are great pets for children that are enamored with aquatic creatures. They are fun to watch and children get a thrill out of watching fish chase after food. There are several different types of fish that you can purchase but I would like to tell you about one of the easiest ones to maintain:the Betta fish. 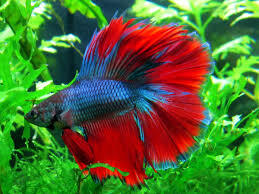 Betta fish come in many different colors and some have wonderful long fins. have decided what type of habitat, fake or fresh plants, you can start to assemble a home for a betta fish complete with structures and marbles for an aesthetically pleasing look. Betta fish eat pre-made food once a day and produce very little ammonia in their urine meaning that algae will take longer to grow. Betta fish habitats do not require a filter and will remain clean 1-2 weeks at a time. Pet stores sell a special additive to treat the water for your beta fish. You must treat the water for at least 24 hours before you put it in the tank, reuse gallon sized water or milk bottles for water storage. With these handful of essentials you can help your betta fish thrive for years.